Dotun Olowoporoku is partner at Starta, a growth advisory platform that helps startups in Africa and emerging markets. Dotun's podcast, "Building The Future", is a one-on-one interview of people who are using technology, entrepreneurship and innovative ideas to shape the future of Africa. Building a growth scalable business starts with choosing the right idea. Imagine two possible business models in the restaurant industry. In one model, you can choose to start a restaurant chain, or you can choose a model to build a platform that aggregates existing restaurants to enable users to discover and book a table with them. While one model can scale fast, the other requires significant investment every time you open a new store. What's the Number 1 secret of ideas that scale? The common thread with every idea that scale is that it depends on technology and is designed to grow fast, both in value and its customer reach. Google - The world’s largest information portal does not create the contents. Let’s see the other secrets that make startups to scale. 1. BUILD PRODUCTS THAT YOUR CUSTOMERS WANT. Startups are meant to solve problem that people are seriously annoyed about, and are willing to pay to let it go. The first step is to validate your startup idea by building a MVP. Note that your startup is not ready to scale until you build an MVP that show that it works and that there are actual customers that are paying or willing to pay for the product. Focus on serving your customer and building an amazing product and also continue to keep the product relevant to your customers' evolving needs. 2. CREATE A GROWTH PLAN FOR YOUR BUSINESS. What makes some startups scale and grow faster than the others? According to Sangeet Choudary it is growth engine. To put that in context, offering free services, promotions, PR and big-ticket ads is good but they are like giving your startup a “bump”. Therefore, in order to grow your startup at scale, you really need is a growth engine. 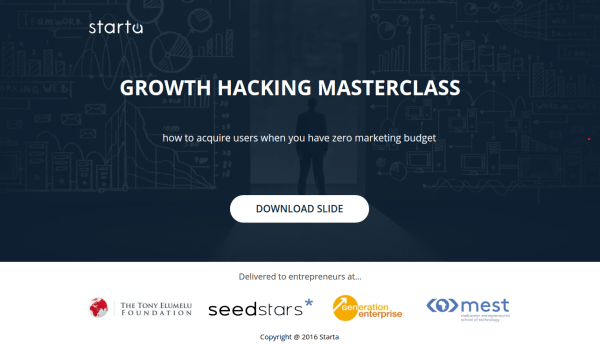 You can get started with resources in this growth hacking masterclass slides. Every successful startups have a dream team. As a CEO, build a self-motivated team that can work with little intervention from you. Doing this well leaves you to time to do the other jobs as a CEO. But, your number one job is to find, recruit and retain the best talents you can find. You won't be able to do all the work yourself, it's why you need a team. Even then, you can't have everything done in-house, at least at the early stage. For example, if you are working on an on-demand printing platform with a shoestring budget, it's infinitely wiser to partner with an offline printing shop to get your jobs done. This will allow you to validate your key assumptions about your product and business model before you sink money into heavy machinery. This was what Printivo.com did at the start. However, don't outsource your core competency. Learn to automate previously labour-intensive tasks. The goal is to reduce human intervention necessary to move your process through. Understand that any solutions that are staff-intensive can't scale. To automate your process, here is a good list of business tools. If want to grow really really fast, you may need to take cash from investors. While you can choose to grow your business organically by ploughing back profit, you need investors' money to get the escape velocity. Uber is a brilliant solution, but without the tons of investors' money in its back pocket, it would not have scaled as quickly as it did in the time that it has. Also, investor money doesn't stop at just the cash injection, having an investor bet on you is sort of acknowledgement that you are doing something right. Investors are like sheep, when you get one, others will come sniffing around. And you may have a virtuous circle of investment and growth, in which every investment facilitates your growth trajectory which attracts further investments. In lesson 2, you will learn that what you do before, during and after you launch your product matters to its growth. Find out the best strategy that allows you to stimulate interest in what you’re doing, even before you launch it.